This is good discipline for me. I read. I write. But I rarely review. For me to come up with even a short paragraph of something which makes sense, can take hours. I don’t want to offend, yet I don’t want to be all rosy. Which reminds me of the Rose Crystal Tower I saw today at Meijer’s Garden in Grand Rapids. 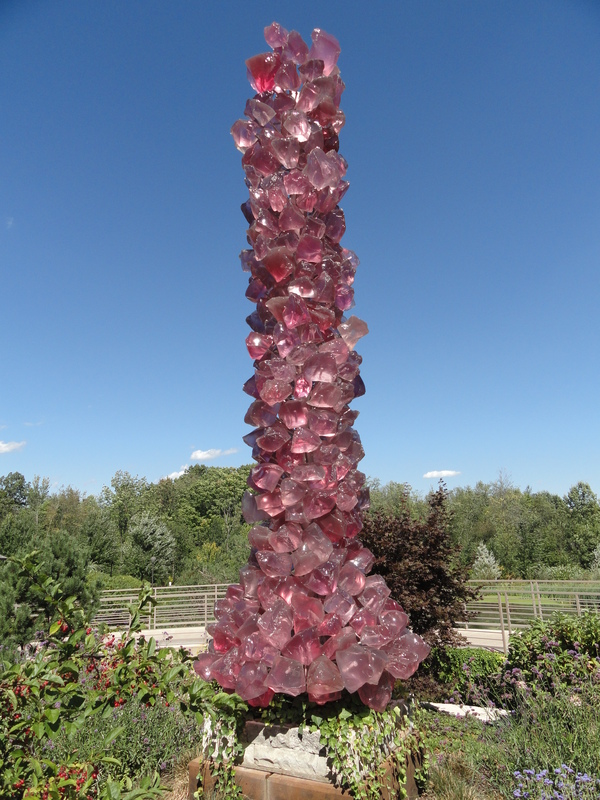 It’s a huge tower made of glass by artist Dale Chihuly, but looks like it’s rose quartz! There were red reeds, also out of glass, standing on a hill behind a driftwood horse, which is really bronze. Giant glass flowers looked like they belonged there. Everywhere I turned I thought Ellie McDoodle would have loved to be checking out these glass sculptures. Who is Ellie McDoodle? Why illustrator-author Ruth McNally Barshaw’s spunky character, of course. Barshaw has written three graphic novels for the 8-12 year old, similar to the Wimpy Kid books. Ellie is our young heroine , camping (in book one), moving (in book two), and doing an animal research project at school (in book three). Barshaw is also a Michigan author. So, check them out — both the glass sculptures at Meijer’s Gardens until the end of this month, and the Ellie McDoodle books, available for a long, long, long time at a bookstore near you! Enjoy. This entry was tagged Dale Chihuly, Darcy Pattison, Ruth McNally Barshaw. Bookmark the permalink. I love Ellie McDoodle. Glad you are participating this week. It makes me wish I had a blog.